Henley managed to salvage a draw from the jaws of defeat in an enthralling contest against Aston Rowant. Thanks to a brilliant spell of bowling from Tom Nugent (5-42), Henley managed to salvage a draw from the jaws of defeat in an enthralling contest against Aston Rowant. Having dismissed Henley for 165 in their batting innings, Rowant looked likely victors with their score at one stage on 113-2 in reply. However some masterful bowling from Tom Nugent, complimented with useful spells from Euan Woods and Euan Brock, ensured it was Henley who walked away with a winning draw, keeping their hopes of a title defence alive. 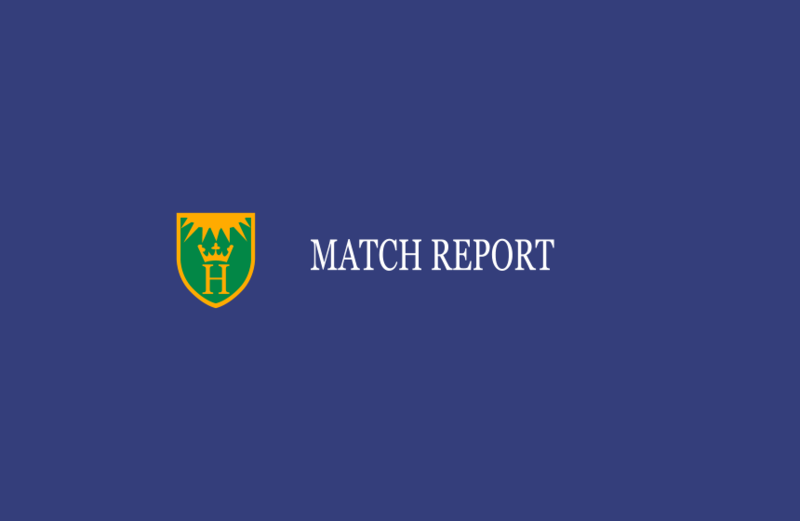 With Rowant holding a good lead over both Henley (3rd) and Slough (2nd) in Division One, Saturday’s fixture promised to be a competitive affair, with both sides aware that victory would significantly change the complexion of the current standings. It was no surprise therefore when, having won the toss, Rowant Skipper Josh Smith chose to bowl, allowing his side to control the game in the second half. His decision appeared more than justified early on too, with the evergreen Morrick quickly nicking-off Rowe and Woods to leave the score on 6-2. The latter can count himself unlucky however, having been caught down the leg-side thanks to the faintest of edges. Despite the poor start, Roberts and Morris worked hard against the new ball to rebuild the Henley innings, playing in a circumspect fashion but also with intent when scoring opportunities arose. With Morrick bowing metronomically from one end, both players stayed aggressive against bowling changes from the other end, allowing the scoreboard to tick over. Not long after drinks however, Morrick struck again, this time bowling Skipper Roberts for 44, with the batsman offering no stroke and leaving the score on 88-3. From this point onwards, with spinner Moriarty beginning to turn the screw with Morrick at the other end, Henley’s innings never quite got going again despite Morris batting beautifully for his 64. Rishton came and went, hitting a catch straight back to Moriarty (2), who then dismissed Williams (5) caught at mid-off. Barnes briefly paired up with Morris, however the latter was soon dismissed, dubiously given out caught behind off the bowling of Morrick. Barnes continued to hold the innings together as the remaining recognised batsmen fell around him – Brock (1) dismissed by Moriarty, Nugent (0) caught at midwicket off Morrick and Afridi (4) falling to Muttit caught at cover, all disappointingly soft dismissals. When No.11 Gurveer Singh (5) was then dismissed, bowled by Muttit, Henley had amassed just 165, with Barnes left unbeaten on 29*. Henley required a quick start if they were to salvage something from the game, which certainly seemed to be for the taking as the wicket continued to get better to bat on. Nugent struck early to trap Reid LBW, before Afridi accounted for Ferreira who was brilliantly caught at slip by Rowe. Despite being 15-2 at this stage, Rowant, like Henley earlier, rebuilt well as both Condon and Smith played nicely to take Rowant passed the hundred mark before tea. However in any sport, it has to be expected that defending Champions will respond to adversity and show a higher level of fight when it is needed most In Henley’s case on Saturday, this came in the form of Tom Nugent. After tea, Henley’s VC charged in with aggression and accuracy, combing well with spinners Woods and Brock to create pressure, chances and wickets aplenty. When Condon was run out for a well-compiled 48, Rowant’s batters fell in a heap. Brock had Watling (2) stumped, before Nugent ripped through Skipper Smith (59), Morrick (4), Pendered (6) and Bethell (6) to leave the home side on 146-8. Despite coming very close on a few occasions to taking the final two wickets, even with the reintroduction of Afridi, Rowant duo of Moriarty and Muttit held on for the draw as the innings ended on 155-8 off 61 overs. Teams for this weekend. 3rd XI host @ruccwhiteknights with start of season BBQ to follow, friends and family welcome! @oucc2019 at home on Sunday! Results from this weekend’s warm up games! Winning the toss and choosing to bat first, Henley amassed 248-8 off their 50 overs on what was a slow and low wicket at Ealing. New man Tom Scriven defied the challenging scoring conditions with an impressive 72, supported by Roberts at the top of the order, and Brock and Williams towards the end of the innings. In response, Ealing began well but soon found themselves behind the 8-ball, as Henley’s attack began to hit its straps. Rishton, Raja, Brock and Woods combined particularly well, ably supported by a strong fielding performance. After a flying start from Ealing 2nds, Henley 2nds managed to stem the flow of runs with excellent spells from Rhodri Lewis, Freddy Loveland and Tom Codling to restrict Ealing to 220-4. In reply, Liam Hilditch and Johnny Connell started positively, and after Hilditch fell for 31, Prakash Gurung combined with Connell to ease to a 9-wicket victory, with Connell bringing up his hundred with a six to end the game. Despite a slow start, Henley accelerated through the innings to reach a respectable total of 225 from their 40 overs. This was down to strong hitting from Donovan, Lubbock and Javid, but also Buckle, who anchored the innings with a brilliant knock. In response, Holmer Green got off to a flyer but regular wickets kept Henley in the game. Javid, Wickramaratna and Ranger all bowled superbly but couldn't prevent a middle order counter attack getting Holmer Green over the line.